EVENTS It took an Italian director, Francesco Zippel, to do a proper documentary on an American director icon, the Chicago-born William Friedkin. 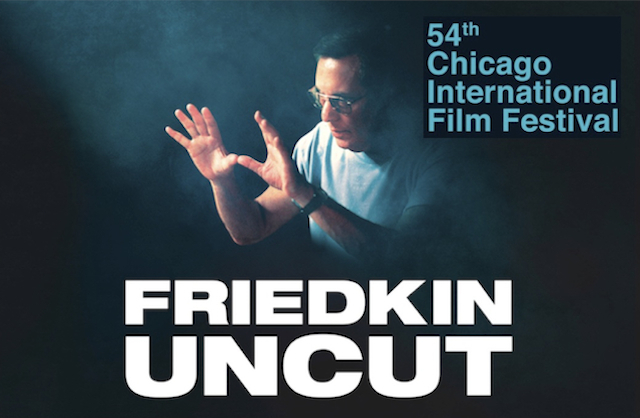 The film is entitled “Friedkin Uncut,” and will be featured along with a Red Carpet event and appearance by the maverick filmmaker himself – who also directed the notable “Socerer” (1977), “Cruising” (1980) and the recent “Killer Joe” (2011) – in a “Tribute to William Friedkin” on Monday. (click here for details). There will also be a Red Carpet event for the film “What They Had” (see below), with director Elizabeth Chomko and actor Robert Forster. FILM OF THE DAY “WHAT THEY HAD” (USA) Some real star power is present in a new film directed by Elizabeth Chomko, featuring Michael Shannon, Hilary Swank, Blythe Danner and Robert Forster. An elder Chicago couple, portrayed by Danner and Forster, is being pressured by their children (Shannon and Swank) to provide dementia care for their mother. Taut and emotional, it features fine performances from all the principal players (click here for more). WATCH OUT FOR… The other film made in Chicago, the independent “Olympia,” directed by Gregory Dixon, making its CIFF premiere (click here). This is a great day to catch the International Competition films. Four films – “Diane,” “Happy as Lazzaro,” “Duelles” and “Too Late to Die Young” – screen on Monday (click).